As the owner of a small business you are always looking for ways to improve efficiency. You want to empower your employees and provide them with the tools they need to be productive, but how can you maximize those efforts while improving your bottom line? Even if your company has nothing to do with the tech sector, there are myriad ways to use some of the latest smart solutions to your advantage. Read on for some ideas to get started. Use automation to your advantage! Think of automated marketing features such as profile-based targeting, using the power of data analytic tools to hone in on specific customers for sales leads. Software tools are out there to allow for the automated timing and release of various marketing materials, helping give you the foresight to create a content calendar ahead of time that is dynamic and personal to the particular customer you are targeting. There are many SaaS tools that can help you save time by automating your workflow. The use of automated email software can generate important clues as to who is seeing your messages and when. Try to automate the client service experience from top to bottom – automated customer service platforms can solve basic issues and allow near-instant replies to queries. Also, tools like Toolyt can be a great add when putting your processes into automation mode. Those of you who are wondering what is “Toolyt”? Here is your answer: Toolyt is an intelligent personal assistant for field sales and service officers, which can be connected with your existing tools such as Salesforce, SAP, internal tools etc. and can be automated with workflows to increase productivity. Apart from Toolyt, there are 20 such sales acceleration softwares that will reduce efforts of your sales team. When you begin to automate customer service, you can allow your employees to focus on the cases that they need to. Let an algorithm deal with the simple tasks and route what is a bit more complicated to the human professionals. The “IoT” is a buzzworthy concept, but how can it benefit your business? The primary advantage of bringing more and more physical things online is the growth of data at your disposal. Think about a smartphone and RFID technology, allowing you to keep close tabs on inventory, customer shopping habits, and more. You want to get a fuller picture of who your customers are and what they value, and real-time IoT data, especially when you can mine and analyze it yourself, is incredibly valuable. The IoT also offers additional opportunities for energy-saving and resources monitoring on-site at your company location. By upgrading to a smart thermostat in the office or choosing to switch to smart lights instead, you can see exactly how much power you use each day and where there’s room for improvements, all from a smartphone app. There are so many “smart” project management and collaboration tools available to help you better organize your business and engage your employees. From Slack to LucidChart, Jira, as well as other tools to communicate, there’s no reason for anyone on your team to get left behind. Cloud storage solutions, including Google Drive and programs beyond that, are free to get started. Project management tools allow you to monitor resources, keep up with project statuses and schedule tasks no matter where you are. Asana is another popular one for companies with employees in cross-functional areas. Remote employees can easily engage with these tools to maintain productivity and check in with teams on-site. There is also an opportunity for software to assist with the automation of your bookkeeping. This type of software had come a long way since the days when you had to hand type everything into Quickbooks – you now have accounting solutions based in the cloud, like Xero, to make everything that much easier. It’s also important to choose the right payment gateways that allow you to process credit card orders in real time. Allowing customers to pay for your products or services from a smartphone is critical today, where many individuals prefer to pay via an app or on their mobile device. It’s important to implement a payments process that allows not only for the convenient transfer of financial data, but also emphasizes security – and for smaller size operations each business model comes with unique needs and requirements. Compare a few options to find what’s best for you. Have you ever thought about having a personal robot helper and all the ways they could help your business? Think of contemporary digital assistants – Amazon’s Alexa, Google’s Assistant, Microsoft’s Cortana, etc – as the latest wave in the trend of business-ready AI. Each of these bots are activated and controlled via voice, making it easy to delegate menial tasks such as scheduling and re-ordering supplies without using a keyboard or screen. As their natural language processing skills become more advanced, it will also be possible to ask them more specific questions regarding web and marketing analytics (Alexa, how many people visited our website last weekend?) or engage with them to predict various business needs and trends ahead of time. 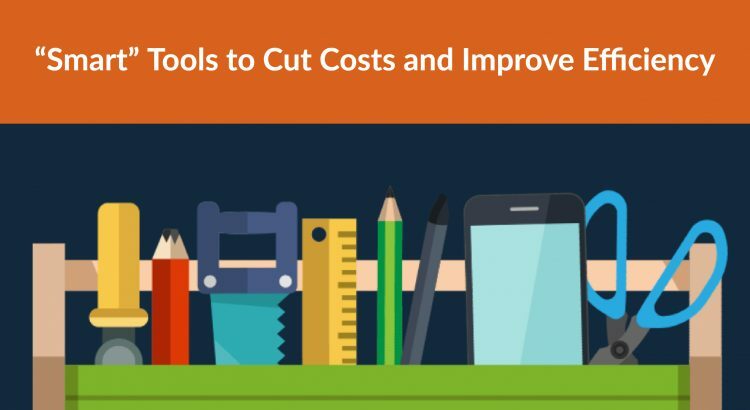 With the diverse range of “smart” tools available to help with finance, marketing, workload balancing, and more, small business owners need to proactively explore what they can do to cut overhead costs and make their business leaner. It all comes down to you having an awareness of the latest technology and leveraging the right tools to make a difference. Beth Kotz is a freelance writer and contributor for numerous home, technology, and personal finance blogs. She graduated with BA in Communications and Media from DePaul University in Chicago, IL where she continues to live and work.